Don't Let Your Tires Go To the Dogs AND Don't Let the Dogs Go To Your Tires! The last thing you want after spending hours washing your vehicle and glossing your tires is for your pooch to wander over, lift his leg, and mark your tires with a spray of his own. Claim your territory and let your dog know what's yours by marking it with tire shine from K9 Tire Shine, LLC. With each spray, you get more than just tire shine; you get a pet repellent that'll not only keep your car looking showroom ready, but will also keep your pet safe and away from vehicles. Based in Canton, Mississippi, we ship our innovative product for customers nationwide. 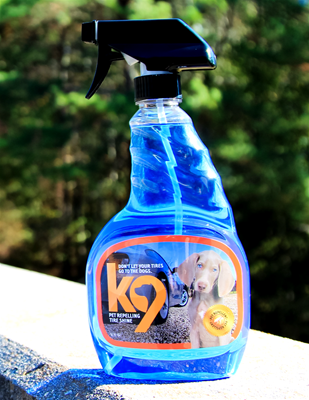 Enhance shine and keep your pets away with K9™ pet-repelling tire shine. Aside from ruining the high-gloss shine you worked so hard to achieve, pet urine can cause unwanted corrosion that may decrease the value of your beloved car, truck, boat trailer, or classic automobile. There are many tire dressing products on the market today, but only K9 Tire Shine can protect your vehicle and its tires from the harmful effects of nature. Add our tire protectant to your collection of automotive products to keep your car looking brand new.